Sama Alshaibi has been selected to show her work at the Prologue Exhibition Chain of Fire at the Honolulu Biennial, Co-presented by Hawai'i International Film Festival and Honolulu Biennial Foundation. 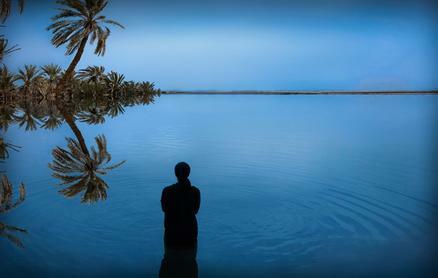 The artist will be showing an installation comprised of 8 videos from her work Silsila. Sisila (meaning chain or link in Arabic) is a multi-media installation chronicling Alshaibi’s five-year cyclic journey through the deserts and endangered water sources of the Middle East and North African and across the bountiful waters of the Maldives. By linking the performances in the deserts and waters of the historical Islamic world with the nomadic traditions of the region, and the travel journals of the great 14th century Eastern explorer Ibn Battuta, the artist seeks to unearth a story of continuity within the context of a threatened future.